Sahastradhara is a very popular waterfall of the Dehradun. During summer it would be fully filled with tourists and local natural beauty lovers. Sahastradhara is not a single waterfall. Sahastradhara means a collection of thousands of waterfalls. ‘Sahastra’ means thousand and ‘Dhara’ means waterfall. It is a naturally beautiful place to spend time with family or friends. 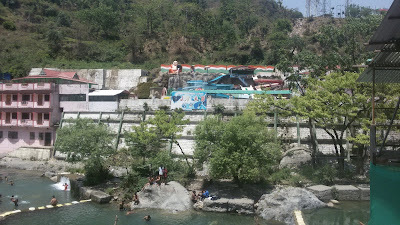 Sahastradhara is famous for Sulphur water where tourists come for taking bath in the waterfall. As per name Sahastradhara, it is the collection of thousands of waterfalls. There are lots of small waterfalls in the hilly area. All springs collectively join and making a big waterfall. These waterfalls are Sulphur water containing. 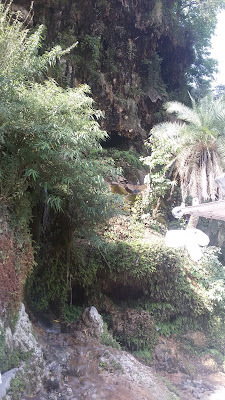 You can see lots of small waterfall there who join in the Sahastradhara. You will not found anywhere such a big waterfall easily in Dehradun. Tourists come here to take a water bath. They feel refreshed after the bathing in Sahastradhara water. Men, women, kids and the elderly person also come here to enjoy the natural water pool. The water of Sahastradhara popular for its therapeutic and medicinal value since ancient times in India. Sulfates are easily dissolved into water. Hills of Sahastradhara area has sulfur-rich rocks. Waterfalls on limestone rocks converted the water into sulfur waterfalls. Sahastradhara is Sulphur containing waterfall which is beneficial for curing the skin diseases such as psoriasis, eczema, and arthritis. Other than skin diseases it is also beneficial for the nervous system, insomnia problems. There is a signboard also at the entrance of Sahastradhara mentioned that peoples suffering from skin diseases can be cured by taking bath in Sahastradhara water. Sulfur water is good for bath only. Sahastradhara water is not good for drinking purpose. So avoid to drink it. Especially for small kids, sulfur water can cause diarrhea. Sahastradhara is the best place for the picnic spot in Dehradun. Tourists enjoy the whole day here in the lap of nature with the beauty of the waterfall. The water level is not so deep so kids and adults can easily take water bath. There are rubber tubes also available for those who don't know swimming. You will find here many types of food and drinking items for enjoying the moment. So you don't worry about anything here all facilities are available here. At Sahastradhara there is also an artificial water amusement park named Joyland. This man-made water park enhances the beauty of Sahastradhara area and provides more options for tourists to enjoy the place. So it becomes a good picnic spot. Sahastradhara Amusement Park is good for kids and also for youngsters. Swings and waterslides of the water parks giving us the extra fun of bath. Joyland is not free in charge so there is some Sahastradhara water park entry fee which changes time to time. Ropeway is very common in hilly areas so you will see ropeway also in Sahastradhara. For seeing the panoramic view of the Sahastradhara from the top of hills you can go for the ropeway. At the top of ropeway, you can enjoy the picnic. 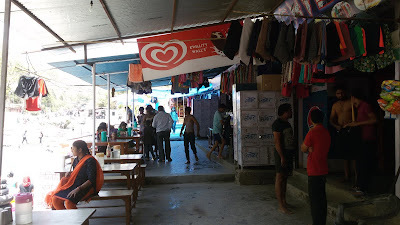 There are also various types of shops such as snacks, food, and wooden item shop. Here you can spend 1-2 hours. Sahastradhara ropeway charges were Rs. 150/- per person for going up and down. Ropeways provide us airy trips which very exciting for many tourists. 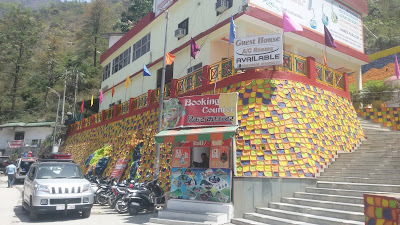 There are lots of fun and enjoyment facilities available at the ropeway Manideep. Such as Children park, Discotheque, games parlor, adventurous sports, restaurants etc. Guru Dronacharya was Lord Shiva devotee. So at Sahastradhara, you can also see Mahabharat time’s ancient Lord Shiv temple. 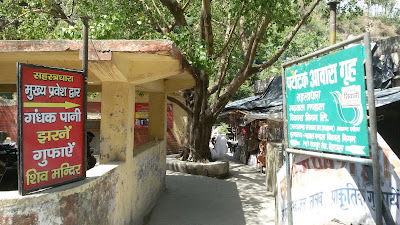 This Prachin Shiv Mandir is situated in the Dronacharya cave. You can go there and worship of Lord Shiva and get blessed. There is another very famous Lord Shiv temple in Dehradun which is also related to Guru Dronacharya. It is Tapkeshwar temple which is too ancient than Mahabharata era. Dehradun is also popular as Dron Nagari. 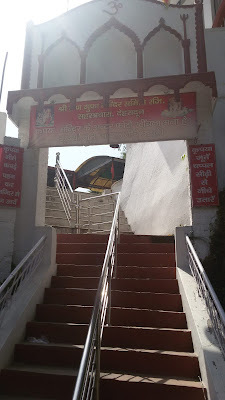 There is Guru Dronacharya temple near the entering gate of Sahastradhara. Temple is small and situated at height. There are few stairs for reaching to temple. You have to remove your slippers before entering the temple. There are few shops near to temple where you can purchase Prasad to offer in Guru Dronacharya temple. Sahastradhara is not only the tourist destination of Dehradun. It is also a study topic for Geology Students. Students from Wadia Institute of Himalayan Geology, Dehradun and other institutes come here to study various aspects such as Paleoclimatic, Sedimentological, Geomicrobiological and Paleomonsoonal of Sahastradhara caves. There are seven small and big caves which are the main attraction of Sahastradhara for tourists and Geology students. Sahastradhara is situated near the bank of Baldi River and Sahastradhara spring water falls into the Baldi River. Baldi River enhances the natural beauty of the Sahastradhara area. Baldi River is one of the rivers of the Song River basin. Sahastradhara is the perfect place for full enjoyment. There is every type of facilities available for all age group peoples. The list of facilities available facilities listed below. Various types of game stalls and shops. Parking facility for two and four wheelers. Swimsuits and bathing cloths available on rent for everyone. Use of plastic bags is prohibited. Pets are not allowed. So keep it in mind. There are no Sahastradhara entry charges. Drinking of alcoholic drinks is fully prohibited at Sahastradhara. Footwear’s are not allowed inside the temples, waterfall and in the river. 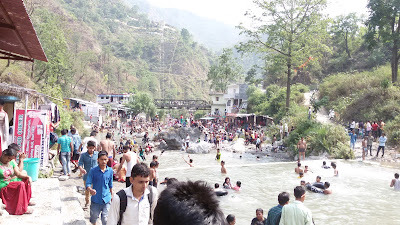 Sahastradhara is popular due water bath in the waterfall. So tourists come here during summer season mainly. So from March to June is the best time to travel Sahastradhara. July to August is the rainy season so avoid to come to Sahastradhara during this time. You can also visit Sahastradhara after rainy season but environment and water also chilled. There is no entrance gate which will be closed or open for tourists. So you can go anytime there. You can go there in the early morning and return in the evening. So the timing will be for summers 07:00 am to 07:00 pm. The total time of visiting this place depends on you how much time you will want to spend here. Minimum you have to spend 2-3 hours to see all the major attractions of Sahastratdhara. Sahastradhara has situated approximately 12 km far away from the Ghanta Ghar. From the Dehradun ISBT Bus stand it will be 15 km and from the railway station, it will be 16 km. 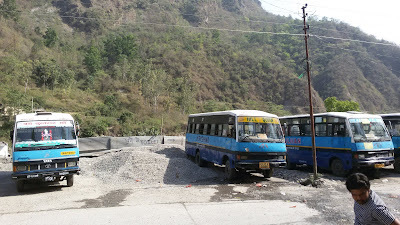 There is a local city bus facility available for Sahastradhara. You will get the Dehradun to Sahastradhara bus from Parade ground near the Ghanta Ghar. The bus fare is only Rs. 17/- per person for Sahastradhara. The bus will reach at Sahastradhara within 20 minutes. From the railway station, you have to take a private taxi or cab. You can also go to the Parade ground and take Sahastradhara city bus. From bus stand ISBT there is no direct bus for Sahastradhara. So you can go by booking a private taxi or cab. There is Vikram from ISBT to Ghanta Ghar and Parade ground so you can also go there by using it. From the Jolly Grant Dehradun Airport, Sahastradhara is approximately 28 km far away so you have to book a taxi or cab.